After the Beep is an interactive installation subverting the iconography of the K6 red phone box. It invites passersby to ask a question that has always been on their mind, or help a stranger by answering theirs. Step inside the box, leave a message or simply stay a while and think about what happens after the beep. 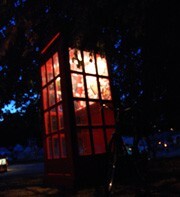 During the first week of Curate the Campus the phone box will pop up in various unexpected locations. Invisible Flock create installations, games and live performances often working with hidden technology. They are interested in the subversion of public space and creating artworks for unusual spaces. Central to the work is a desire to place audiences as empowered co-creators of the experience, whether through installations that are entirely user-generated, or through theatrical game-play that allows for choices to affect the outcomes of the piece in a meaningful way.